I'm down 50 pounds in 6 months, and I feel great! I've always struggled with uncontrollable hunger, but with the hunger under control I've been able to manage my portions and stop the late night binge eating. The staff at the clinic are awesome, the hours are convenient, the prices are very reasonable, appointments never run more than 10 minutes behind schedule, nobody tries to pressure me into services I don't want, and I've met with Dr. Rivas personally almost every time I've been there. I lost 57 lbs in a few months. Even better though, I no longer have diabetes, high blood pressure, high cholesterol, and or sleep apnea. I initially only joined the program because of my wife’s nagging, but I am so happy I did! The change is so dramatic, I need to get a new ID because people don’t believe it is me. When I heard about Rivas I was very unhappy with my weight and I was getting married in a year. After about 2 weeks on the program I had already lost weight and had way more energy. One year later and I am so happy to let everyone know I looked DAM good for my wedding and was the weight I wanted to be: 60 pounds lighter! I’ve been a patient here for 2yrs now and love it! They have not only helped me reach my goal but maintain. Only place I have found that will stay with you. I wanted long term real weight control and Dr. Rivas provides that. 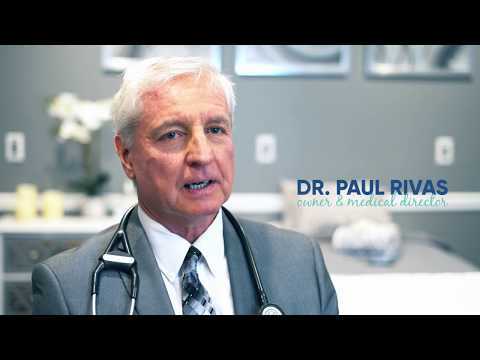 Meet Dr. Paul Rivas M.D. Dr. Paul Rivas is a sought-after expert in the field of weight loss. Board Certified Physician, with over 25 years of experience, Dr. Rivas has an exceptional determination to fight the serious and growing health risks caused by obesity. He has received 13 awards for excellent health care, including “Most Compassionate Doctor” and “Maryland’s Top Doctors.” He is an author of 5 well-received books about medical weight loss and has been featured in Vogue, The Wall Street Journal, Good Morning America, and more.